Let us assume that, just like everyone else, you are building a website–after all, the Web is where it is all happening now. As soon as your website goes live–and especially while you are still in the design and development phase–you need to make sure your site’s content will be found through search engines such as Google, Yahoo!, and Bing where many people go to look for information. Whether you’re starting a blog or deploying an e-commerce solution for your clients, it’s a good idea to keep in mind some good web development practices that will enhance your chances in search rankings. This article follows up on a previous Six Revisions post called 9 Ways To Improve the SEO of Every Website You Design, sharing with you a few more tips for improving the search engine optimization, semantics, web accessibility, and interoperability of your web designs. Don’t call me patronising–it goes without saying–but try not to use Flash when HTML/CSS should be used. Flash has its place on the Web: it’s great for interactive components such as sophisticated learning activity games with audio and video, and 3D animation. It’s better served as components of an HTML/CSS site than as the technology that powers the entire site. For example, check out Kongregate, a popular social Flash gaming site. Although Flash is their bread and butter, they still use HTML, CSS, and server-side scripting to power their site functionalities. It is easy to forget how important images can be for SEO and web design alike. Name the actual file correctly by giving it a key term (e.g. yellow-banana.jpg and not some random name like img2gtc92.jpg) because this gives your site assets extra context. Make sure that you give the alt property of the image similar key terms and a decent and succinct description–aim to keep it 10 words or fewer. In addition, Google Images is another way to get traffic to your site, and if you name your image files well and give them excellent context through their alt property, you will improve your chances of showing up in Google Images results. Internal linking–hyperlinks that point to other web pages on your site–is important, so try not to have more than 150 links from page to page so that you don’t dilute your web pages’ rank. Too many internal links can overcrowd the page and can also slow down your users’ ability to find the link they need. Some may think that increasing the value of a particular page involves repeatedly linking to the same page from another page. Search engines will only count the first instance of that link, so there is no need to repeat links. In addition, this is a poor practice that will confuse your users. Deep linking are links that point to internal pages instead of the main/home page. It is a fantastic way for you to send power to pages deeper in your site outside of your home page. Deep linking also promotes the exploration of your site by visitors, providing additional points of conversions. Blogs are a great way to keep building fresh content on your site and targeting long-tailed key terms. A possible idea is to bring snippets of blog posts onto related pages for fresh content on these specific pages. Make sure that your branding is very clear and that your brand name is obvious on your website. This makes for an easy way for people to remember who you are and augments the possibility of people searching for your brand name on search engines. Being searched by your brand’s name also means that you won’t compete with generic words that people often use in searches (i.e. “budwieser” versus “american beer”). 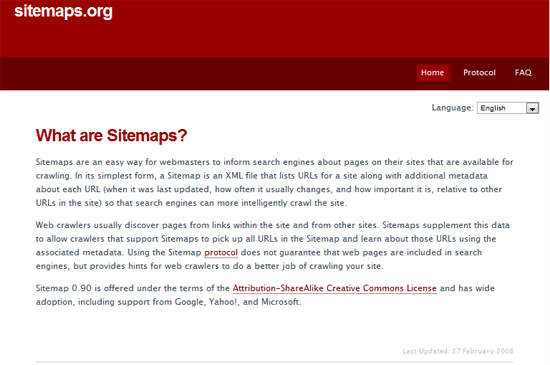 An XML Sitemap is a protocol that aids search engine crawlers gain contextual meaning about your site’s web page. If you’re using a content management system, see if it has an XML Sitemap extension (or built-in feature) that will automatically generate the XML file for you. If not, you can use a tool like XML Sitemaps Generator. When linking through to your deeper pages, use your anchor text as precise and short pieces of information. It is important to use keywords that search engine bots can relate exactly to your page. For example, if you’re linking to a web page about Maldives holidays, your link should be <a href="/maldives-holidays.html">Maldives holidays</a>. This way people, as well as web robots, easily know what they are going to get.